Should we be going crazy at winning just two Olympic medals? With a population of 1.3 billion, should we be going crazy at winning just two medals (gold not included)? 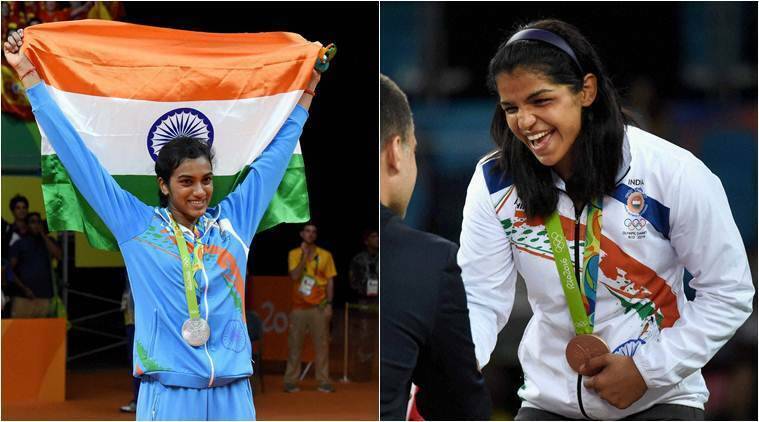 We are indeed very proud of Dipa Karmakar, Sakshi Malik and P V Sindhu for their super achievements in the Olympics and bringing honour to our country. We congratulate them, their coaches and families. Money is being showered by sponsors and state and central governments over them, specially Sindhu. There is virtually a competition among state chief ministers over who would award the maximum prize money. Even Delhi government — which certainly has no role in their achievements — does not want to be left behind. The points is, isn’t there a better way to acknowledge them? Where not only their achievements will be remembered and cherished, but also would give an opportunity to other upcoming talented young Indians, who may never make it to the podium for the lack of infrastructure and financial support. The State CMs are showering crores of rupees on the athletes who won medals. Whose money are they spending after all? Does that money not belong to the taxpayers? Don’t the tax payers deserve better sports/other facilities which are not made available for lack of finances? Just look at the tragic end to the life of a national level handball player. Pooja, studying at Patiala Khalsa College, allegedly committed suicide after she was denied free hostel facility by her college in spite of the promise for free hostel and food. In the suicide note Pooja addressed to the prime minister, she wrote that she was ending her life as she was unable to pay her hostel fees and travel expenses. Pooja urged the PM to ensure that underprivileged girls like her be provided free education facilities. Without free hostel accommodation it was financially not possible for this promising girl to travel to her college. I am sure there are thousands of Poojas, who, given the opportunity, would excel not only in sports but many other activities as well and bring laurels to our country. Take the case of 12-year-old Shubham Jaglan, a proud son of a milkman in Haryana, who became the world number one junior golf champion after winning the championship held in San Diego, USA. This young talent had no money even to travel to tournament venues. Had it not been for the support of Indian Golf Foundation, Shubham’s talent would have been lost and would never have surfaced. I have no doubt taht he is a promising Tiger Woods of India and once he attains world fame, all the CMs and the corporates would make a beeline and pour money before him when he may not need it as much as he does today. With a population of 1.3 billion, should we be going crazy at winning just two medals (gold not included)? India ranked 67th out of 87 countries that won at least one medal. Even Mongolia won two medals, one silver and one bronze. USA led the tally by winning 121 medals. We are below Kosovo that has a population of about 18 lakhs and an area of 4,212 square miles! Azerbaijan won 18 medals including one gold and seven silver in a population of 9.4 million people. Algeria won two silver medals and has a population of 39.21 million people. When USA wins 121 medals, the president of USA congratulates TEAM USA and not only Michael Phelps — who won maximum individual gold medals. Without team work, individual talents cannot shine. Young Indians have potential, zeal and the talent to win medals but without team work it will only be a victory of individuals. Dipa Karmakar, Sakshi Malik and Sindhu fought against all odds to be where they are, not necessarily because of Ministry of Sports but perhaps in spite of it. So the question arises — do we need a Ministry of Sports at all? Why not spend the annual budget required to run the Ministry of Sports, which is about Rs 1,600 crores, directly in building public sports infrastructure and giving free education and required facilities to our talented but poor young Indians? 1 Torrent ban: Long-term anti-piracy strategy or just scare tactics? 3 Olympics to drug discovery: India a laggard?